Reads Island lies about 50mtrs into the River Humber. North of the riverbank at South Ferriby, close to the outlet of the River Ancholme. The island at present covers an area of about 200 acres though the area is constantly changing as the river deposits silt only to wash it away with later tides. The riverbank around the South Ferriby area has been eroded from a point in 1630 when it was level with the North end of the present Reads Island. At low tide the remains of an old Roman road can be seen on the river bank to the West of the Island. It was only in the mid 1800 that the permanent more solid protective banks around South Ferriby were built, and these still protect the village and surrounding land today. There have always been mud banks in the river around this point and Reads Island developed from the bank known as Ferriby Sands or sometimes-Old Warp. It is believed that the island may have been created because of the wreck of a French Schooner though there were also some alterations to the outlet of the River Ancholme which may have played their part. The villagers of South Ferriby also may well have helped its creation when they sank an old navy ship filled with rocks to help protect the embankments. It was in the early 1800 that there were the first reports of grass growing on the top most parts of the Old Warp. The Island became known locally as Reads Island because of the Read Brothers of Burton Stather who worked the island. As well as farming the Land they set about reclaiming more land by the system called warping. This works by building low wall at the high water level. As the tide overflows these banks the water is held back as the tide recedes and the water deposits it mud and silt before it is then released. Over a period this deposit builds up and eventually becomes solid and grows above the normal high water mark. The Read brothers also found fresh water well on the island, which allowed habitation and livestock to be kept on the island. It wasn't until around 1850 that the island appeared on the ordinance survey maps and it was then that it named Reads Island. The first people to inhabit the island were shepherds employed by the Read brothers and they lived in huts. The first record of semi permanent residence was in 1861 when it was reported that a William Foster, his wife and two children lived on the island. They lived in a wooden cottage and worked as shepherds for the Read brothers. The first recorded sale of the island was in 1871 when Humber Conservancy bought the island from the crown for the sum of £9,000. The land was rented out by the Humber Conservancy Board rented the land out for farming and grazing on the condition that the tenant maintained the embankments. Because of its isolation the island was used to develop new strains of sheep and cattle. Humber Conservation also noted its isolation and had a store of explosives on the island, which they used to blow up dangerous wrecks on the Humber. There were also reports in the 1800s of the island being used as a drop of point for illicit goods brought from the continent on the passing boats. There were also reports of an incident on the island during the Second World War. It was reported that a twin engine bomber presumably from one of the local airfields crashed on the Eastern side of the island. The plane was on a training flight and there were reported to be no survivors. After the war the Nickerson family, who now had charge of the island, added a lodge to the existing brick built house on the northern side of the island. These properties we used to entertain shooting parties on the island some of whom were thought to have royal connections. The deep-water channel in the River Humber is constantly changing position. In the 1970's the channel moved to the South side of the island thus causing seagoing vessels to navigate the narrow straight between the island and the South bank of the river. As you stood on the main road to Scunthorpe, the A1077, you could shout to the crews of the boats as they worked on the deck. These boats were using the berths at Goole and other ports to the West of the river. This only lasted for a few years before the channel reverted back to the north side of the island. The island has been used in recent years for the grazing of deer, which can be seen with the naked eye grazing on the banks. There have been many occasions when deer have been reported loose around the South Ferriby area as they have swam the fast flowing channel to the mainland. The last semi permanent resident moved off the island in 1989 though there are still expeditions of bird watchers who travel too the island as it is an important nesting and breeding area for many rare birds. It also acts as a stopping off area for many birds in their migration during spring and autumn. Twitchers can often be seen on the riverbank at South Ferriby and when rare specie is reported they line the banks for weeks in the hope of spying the traveler. Over the last 10 years there has been major erosion on the North side of the island as many banks have collapsed. As the river gradually crept closer to the buildings it was decided that they should be demolished. They were firstly gutted by fire to destroy any wood, which could float away, and the brickwork was demolished. 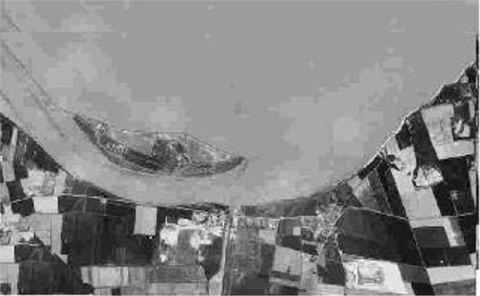 There were at one time serious doubts that the island would continue to be detached from South Ferriby and the channel was almost completely dried up at low tide. The silt gradually began to build up on the South side but now this seems to have been reversed and the channel is now growing once again. The island has been in the news on a few occasions recently when whales of one type or another have been washed up on its mud banks. Today there are many volunteers who turn out to try and re-float these stranded creatures unlike the time in the past when the villagers were intent on killing these creatures for food and fuel. Should you visit the are then please make a point of looking over to the island? The nearest point is on the main A1077 road to the West of South Ferriby towards Scunthorpe. For a fine view looking down on the island you can climb the hill on the road towards Barton and look over the fields. Should you wish to find more information about Reads Island and the brick and tile works in the area of South Ferriby I can recommend the Book " The River and John Frank" written by Raymond Carey. This book is sold to raise money for the Humber Keel and Sloop Preservation Society who have restored and operate the Keel " Comrade" and the Sloop " Amy Howson". The latter vessel is usually berthed at South Ferriby and can be seen as you cross the River Ancholm at the lock gate.